Move over, acai. Food and flavor companies are hunting for the next big berry. Berries are the bomb and few of us need convincing to try them out. Berries are nutritional royalty these days for their reputation as both a “low glycemic food” and a rich source of antioxidants, the substances that may protect cells against the damaging effects of “free radicals.” And like a dash of red lipstick, berries provide a splash of rich color and an upscale aura to supermarket products ranging from breakfast cereal and granola bars to juices and yogurt. Their fan base spans from the health- and diet-conscious community to picky toddlers. Most berries want to emulate blueberries, which have transformed from tasty things found in muffins and pancakes to stars of the produce aisle, says Lu Ann Williams, head of research for Innova Market Insights, based in the Netherlands. Now more varieties want to make the leap from seasonal treat to staple. Since 2008, Innova says, U.S. marketers have introduced 358 products with goji berries as an ingredient, about 200 with bilberry and more than 500 with elderberry, the latter driven largely by its use as a natural food coloring. “They’re here to stay,” Ms. Williams says. Growing demand has led U.S. farmers to plant more acres of berries and spurred imports from more growers overseas, especially raspberries from Mexico and blueberries from Chile. Their tiny size often means laborious handpicking and special packaging and shipping, and many travel long distances to American supermarkets. The result is that berries remain a premium product, with an average retail price of $2.82 for units comparable with $1.68 a pound for stone fruits like plums, peaches and nectarines, according to Nielsen Holdings N.V NLSN -0.30% .’s Perishables Group. No wonder berry consumers tend to be higher-income, says Roberta Cook, agricultural economist at the University of California, Davis. “Families with kids living in affluent suburban neighborhoods and cosmopolitan areas index extremely high for berries,” she says. In the past two years, weekly same-store supermarket sales of berries have risen 18%, according to Nielsen, despite an average 4% rise in retail prices for the berries in the same period. Sales of raspberries rose 31%, and blackberries and blueberries 27% and 25%, respectively. Strawberries’ respectable 11% increase is actually a drag on growth. Of course, as with a lot of dietary health claims, consumers’ hopes often outweigh the scientific evidence. Once best known for flavoring ice cream, black raspberries are now playing a role in cancer research. 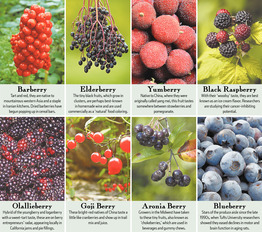 Don Sturm has more than doubled the size of Sturm’s Berry Farm, in Corbett, Ore., in the past five years to 290 acres. He grows everything from blackberries to Marionberries, but much of his new acreage is devoted to black raspberries. In 2009, Mr. Sturm formed a partnership with a cancer researcher, Gary Stoner, and a tech entrepreneur, Steve Dunfield. Their company, BerriHealth, sells black raspberry liquid extract and freeze-dried powder to university researchers testing the effects on cancers and chronic inflammatory diseases. Some trace the start of the berry boom to the late 1990s, when Tufts University researchers showed that a diet of blueberry supplements helped alleviate age-related declines in motor and brain function in rats. In addition, blueberries are rich in anthocyanins, pigments that provide the dark-blue color and offer antioxidant benefits. The Tufts findings fueled hundreds of studies on the effects of other berries on cancer prevention and heart health, says Mary Ann Lila, director of North Carolina State University’s Plants for Human Health Institute. Next came acai, the small, black berry from Brazil, which made a splash in 2008, when TV doctor Mehmet Oz called the acai an “antiaging” food. The tiny, purple aronia berry, or chokeberry, a native of the eastern U.S., had all but disappeared from cultivation until growers saw its potential as a health food. The Midwest Aronia Association formed in 2008. Westin Foods, of Omaha, Neb., whose top-selling food product is bacon, now sells aronia berries under the Superberries brand in packets of gummy chews for kids and in concentrate form for adding to smoothies. Unfamiliar berry flavors can be earthy or tart, as in the case of goji berries and bilberries, which are the blueberry’s smaller, tarter cousins. To introduce these flavors to consumers, many companies blend them with sweeter, more-familiar flavors, like raspberry or pomegranate, says Ed Nappen, a senior marketing manager for International Flavors & Fragrances Inc., IFF -1.30% the big supplier of ingredients based in New York. Barberries are tart, currant-size red berries known primarily in Iranian cooking. Dried barberries—called zereshk—can be found in Middle Eastern markets. Clif Bar & Co.’s “Kit’s Organic” line of snack bars, launched a year ago, features a Berry Almond flavor that contains barberries along with dates, bilberries, almonds and sea salt. “I had never heard of them until our cook in the kitchen said, ‘Hey, try these,’ ” says Tara DelloIacono Thies, Clif Bar’s registered dietitian. “Shocked” is how she describes her reaction to the flavor. They give a “nice balance” to the sweet dates, she adds, and their smaller-than-a-raisin size adds unique texture. A version of this article appeared July 10, 2013, on page D1 in the U.S. edition of The Wall Street Journal, with the headline: America’s Next Top Super Berry?. The berry connection was uncovered in a new study led by Dr. Eric Rimm, associate professor at the Harvard School of Public Health and Harvard Medical School. He and his team gathered data from 93,600 women, who, at ages 25 to 42, signed up for the Nurses’ Health Study. Over the course of 18 years, they reported how often they ate various kinds of food. Berries emerged as a protective factor. Women who ate the most blueberries and strawberries were 34% less likely to have suffered a heart attack during the study period than women who ate the least of these fruits. How much berries are needed? “The people with heart benefits had three or more servings of half a cup of blueberries or strawberries each week,” Rimm says. “The sooner people start the type of diet that includes a higher intake of blueberries and strawberries, the better,” Dr. Rimm says. The Harvard Heart Letter is available from Harvard Health Publications, the publishing division of Harvard Medical School, for $20 per year. Subscribe at www.health.harvard.edu/heart or by calling 877-649-9457 (toll-free).